As a member of Their Lordships' House, I have carefully canvassed a good many well-informed British friends about the astonishing sequence of political events in that country's relations with the European Union to see if anything could be predicted from them. To review for those who have not followed it closely, the former Conservative prime minister, David Cameron, had the insane idea of holding a referendum to stay or leave, with nothing in between, having promised to produce "full-on treaty change." What he produced was the possible variation of benefit systems for newly arrived people from elsewhere in Europe in the U.K., subject to the agreement of all the other 27 member states. I wrote at the time that Cameron brought back less from Brussels than Neville Chamberlain had from Munich. The public was so affronted by this frivolous referendum choice, a tiny amendment or entirely out, that they called his bluff, despite an intense operation to terrorize the country about the dangers of Brexit (as it was universally called), led by the chancellor of the exchequer, George Osborne, and the governor of the Bank of England, Mark Carney (formerly governor of the Bank of Canada). From their accounts, grass would be growing in every street in the City of London three months after departure. The British are the wrong electorate to try to intimidate in this way, and they voted 52 to 48 per cent, a margin of 1.3 million votes, to leave the European Union. The prime minister and the chancellor had gambled all their political capital on the EU connection and appropriately retired from public life. The foreign secretary, Philip Hammond, was just installed and relatively unknown. Historically, a retiring prime minister is always replaced by the chancellor, foreign secretary, or home secretary and the home secretary, Theresa May, was reasonably well-known, and while she had ostensibly been a remainer, had been conveniently ambiguous. The leader of the Conservative leavers, former London mayor Boris Johnson, sought the leadership, but it was clear the Cameron-Osborne faction would support May, and Johnson withdrew in exchange for the foreign office, as Hammond replaced Osborne. May made one of the first of a cascade of horrible mistakes by calling an election, although she already had a clear majority in a young Parliament. She said she wanted a stronger hand to play in negotiations with Europe and instead limped in without a majority, dependent on the Democratic Unionist Party, the reasonably house-trained descendants of the party founded and led for 37 years by the fire-breathing anti-papist, The Reverend Ian Paisley. Notice was eventually given to Brussels and negotiations were conducted between the U.K. government and EU officials on terms of departure. The challenge was very complicated because a majority of the Conservative members of Parliament had opposed exiting Europe, and the majority of Conservatives in the country and of the whole population continue to wish to withdraw. When May unveiled her compromise proposal for remaining in the Common Market, paying some of the fees of membership and accepting some of the directives from the EU and discarding the rest, Johnson and others resigned from the government. May was able to get her deal approved by the European Union. If Cameron had brought this arrangement back from Brussels in 2015, he would have won his referendum easily, but the polarization of the issue was now inexorable. May had the foresight to secure a confidence vote among her own MPs while the credibility of her leadership was more buoyant than it is now. Under the constitution of the British Conservative Party, a leader who wins a confidence vote of the party MPs can continue in office for a year after that without another challenge. May won this vote by the severely divided margin of 200 to 117, again, a substantially greater erosion than Chamberlain suffered in 1940, bringing in Winston Churchill as head of an all-party national unity government. But her proposals for altered association with the European Union were twice defeated in the House of Commons by wide margins. The U.K. was committed to leave the EU on March 29 if no agreement had been reached, but that has been altered to leave on May 22 unless an agreement is approved by the U.K. Parliament next week. 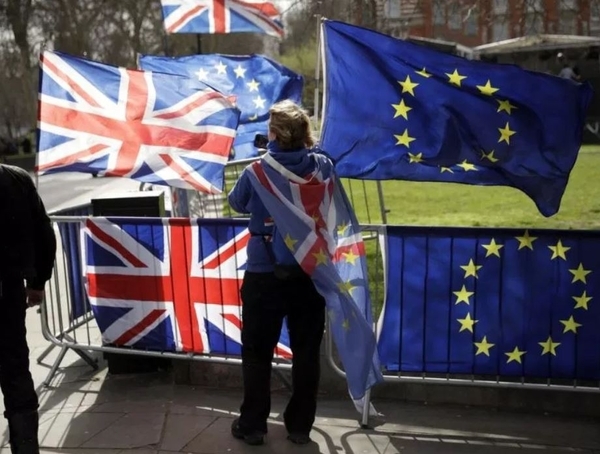 If there is no such parliamentary approval, the U.K has until April 12 to decide whether to seek a longer delay and participate in the Euro-elections, or withdraw on May 22 with no deal, "crash out," as it is described. Almost everyone in Britain agrees that it is a pitiful and contemptible state of affairs: no majority in Parliament for any option, no apparent chance of acceptance by Parliament of the best deal May can get from Brussels, and to compound her own errors, the prime minister led a majority parliamentary vote last week opposing a simple departure with no deal. President Trump has repeatedly offered the U.K. a trade deal to replace the EU. This was her chief bargaining chip opposite Brussels and she threw it away. The United States would be a better arrangement — the U.S. is a much stronger economy and as the Americans will not concede any sovereignty to another country, nor will it demand any. Whatever Canadians may have thought of the Canada-U.S. Free Trade Agreement, the U.S. never attempted to assert any of the insolent bureaucratized dirigisme that Brussels inflicts upon E.U. countries. This, more than concerns of immigration, is the greatest problem the British have with the EU. The Germans are accustomed to regimentation and don't especially notice it, and are the strongest country in Europe anyway (though they are still too traumatized by the crimes and atrocities of the Third Reich to act like it). The French and Italians generally ignore most regulations wherever they originate and aren't particularly bothered by Brussels. But the British like to be law-abiding, but they do not like overbearing regimentation, and especially not from foreigners. (We are all unlicenced psychiatrists and I have long felt, having met them at countless conferences, that the EU is essentially a group of Dutch, Belgians and Luxembourgeois who are acting on generations of frustration at their subordination to the Germans, French and British.) The EU is now suspended between control by the member states and control by the EU apparatus, which is not answerable to the leading member countries or to the ludicrous talking shop of the EU parliament. The speaker of the House of Commons, John Bercow, rivalled only by Corbyn and the mayor of London Sadiq Khan as the most nauseating public personality in Britain, has told May she can't present the same measure again in the same sitting of Parliament, but she is commendably ignoring that. I had assumed that May was, as she claimed, basically a leaver, and had set it up to go without a deal and straight into the arms of the U.S. and blame the failure to reach a deal on the intransigence of Brussels, Corbyn, and some of her own MP's. It now emerges that she is a spavined pantomime horse of releave and lemain, trying to muddle through ambiguously until either Britain is forced out by the clock or there is a second referendum that cancels the first. She seems incapable of leading and wants events to lead. I predict that there will be no agreement in Parliament next week, nor prior to April 12, and that crashing out will be almost completely painless and imperceptible, and May will either take the hint that she has a serious confidence-problem and go, or fumble along until November and be handed a bus ticket. In either case, the new prime minister will be a compromise candidate but a leaver, such as the former Brexit ministers, Dominic Raab and David Davis (both of whom quit in disagreement with May's concessions to Brussels). The British will be much happier with the Americans and ourselves than they have been with Brussels, and will negotiate trade arrangements with the EU similar to those of Norway and Switzerland. As in many things, the imagination of Brexit will be more torturing than the reality.